The combination of strong growth prospects and an attractive valuation make this my top stock to buy right now. The S&P 500 is trading near its all-time high, which is making it hard to find real bargains in the markets. In times like these, it's important for investors to only put money to work in the highest-quality investments they can find, and my top stock pick for the month of September fits that description perfectly. Once upon a time, I thought The Priceline Group (NASDAQ:BKNG) was just another travel website. With hundreds of other travel sites to choose form, I was left scratching my head at why this stock was such a market darling. Thankfully, once I was educated about the business I too saw its massive potential, and the company has since grown to become one of my largest personal holdings. So, what sets the Priceline Group apart from other travel sites? The answer lies in its top-notch management team that has acquired a portfolio of brands that have become the envy of the travel industry. That list includes sites like Kayak.com, Rentalcars.com, Agoda.com, Opentable.com, and of course, priceline.com. However, I'm so bullish on this company because of its cash-cow business Booking.com. Booking.com was the top dog and first mover in online travel in Europe, giving it a huge head start in the race to build out its hotel network. That's important, as most European hotels are run by small business owners, so they lack the expertise and resources to make their hotel available to online travelers. In response, they've welcomed Booking.com with open arms as the site helps them to fill their vacant rooms, and also provide back-office functions like customer service and marketing. In exchange, Booking.com takes a small commission for each hotel room it sells. Since Booking.com was the first company to take advantage of this opportunity, it has built out a truly massive network of properties. As of Q2, the site counted over 1 million properties representing 23.7 million rooms, making the site the go-to place for any European traveler who values selection. As the company grew, the network effects started to really kick in, and the financial implications have been nothing short of magical. Despite this company's unbelievable run, I think there are plenty of reasons to believe that fast growth will continue. For one the global middle class is still growing and becoming wealthier, which should drive steady increases in the demand for travel. There's also the fact that travel agents still exist, but given the cost savings and ease of booking travel accommodations online, I think the Priceline Group can continue to win market share. Of course, Priceline won't be the only winner in the move to online travel, so it has wisely built out partnerships with some of the other leading players in online travel. The company owns a 10.5% position in Ctrip.com International (NASDAQ:CTRP), a leading book agent in China: The two struck up a partnership deal that will give Chinese consumers access to the company's inventory of hotels. The company also struck up a partnership deal with TripAdvisor (NASDAQ:TRIP), the global leader in online reviews, that added the company's property list to TripAdvisor's "instant booking" platform. Finally, when you zoom out and realize that the global online travel market is estimated to be worth $492 billion, Priceline's trailing-12-month revenue of less than $10 billion doesn't seem so astronomically high. 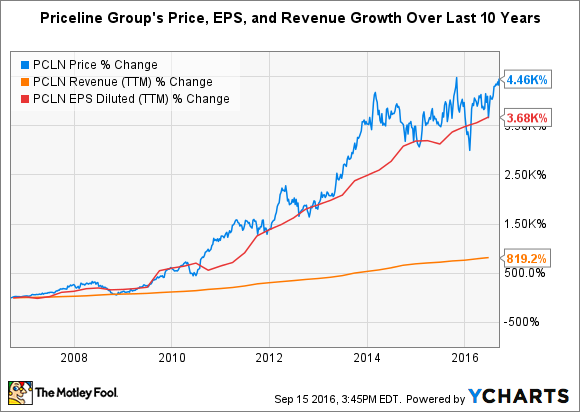 With a trailing P/E ratio of more than 27, you might scoff at the idea that the Priceline Group is a value stock right now, but I think that's being a bit short-sighted. Priceline is projected to produce roughly $80 in EPS next year, which means the company's forward PE ratio is only 18. Believe it or not, that's a discount to the S&P 500's forward P/E ratio of 18.5. Add to that the fact that analysts are projecting this company to grow its EPS by nearly 16% over the next five years, and buying today gives you higher growth and a lower multiple than the markets in general. In total, I think there's real reason to believe the Priceline Group has everything investors look for in a high-quality investment. Yes, there will always be short-term global events that cause a hiccup in the company's business -- the 2014 Icelandic volcano eruption of 2014 and the recent Brexit immediately come to mind -- but over the long haul, I have high confidence in this company's ability to thrive. That makes this company a great buy-and-hold candidate, which is why it's my favorite stock to buy this month.